I haven't done a Julep unboxing in quite a while. I've gotten some great polishes over the last few months, but this box is especially exciting and I had to share it with you! My favourite part about this box is the 20s theme and with the new Gatsby film coming out, I just cannot get enough of that era. There were a few different combinations with the May boxes. Depending on the style you chose, you could have received varying colours of nail polish, one of two different lipstick trios (the Paris trio and the New York trio) or a specially packaged lip scrub. I stuck with Classic with a Twist, mainly because, out of the two lipstick trios, Paris was my favourite. Starting with the polishes, I received Myrtle (a deep "flapper" red) and Zora (a frosted light pink). 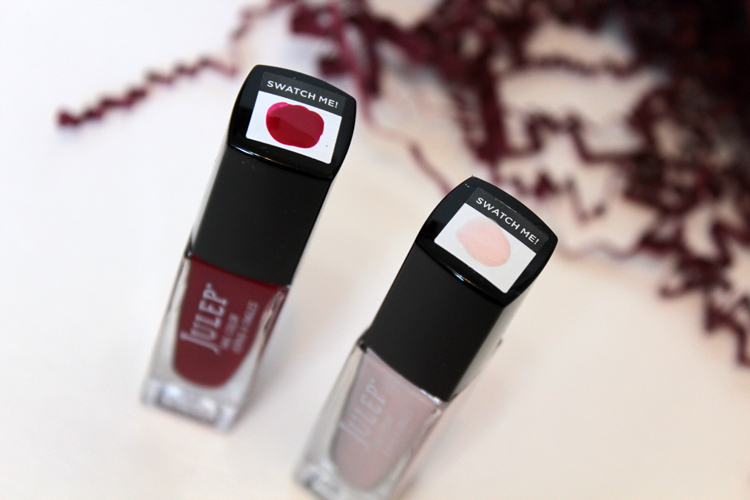 Both are great shades, though the red is my favourite. I love the "swatch me" stickers on the lids. It's really convenient to be able to see how the wears. Not to overshadow the polishes, but I was most excited for these lipsticks. They just looked so great in the promo pictures. 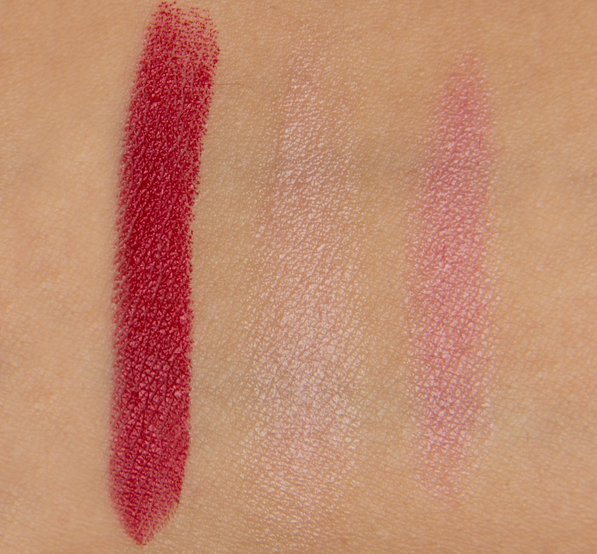 Like I said, I got the Paris Jazz lipstick trio. I just got this box in the mail yesterday, so I haven't been able to try all the shades on, but I wore Charleston today & I did like it. It was fairly moisturizing. Colour payoff was good. It didn't last very long, but I expect that with sheer finishes. I'm eager to try the other shades. The gold packaging is simple. Twisting the bullet up isn't as smooth as other lipstick tubes, but it's manageable. I also love the size of lipstick tubes, they only contain 2.1g of product & almost look like miniatures compared to some other lipsticks. The last thing in the box was a set of hair clips. 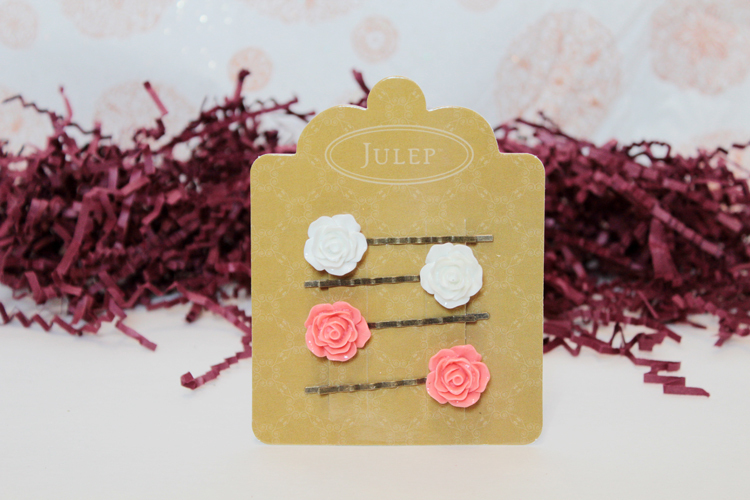 They're little rosettes attached to bobby pins. I think they're cute, though I'm not sure how much use I'll get out of them. Actually, they may come in handy to clip back my unruly overgrown bangs. So that was my box. 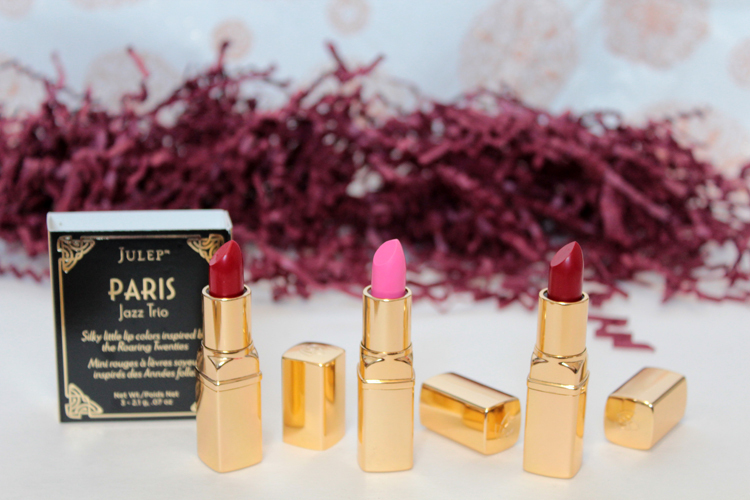 I enjoyed everything I received & Julep is definitely one of my favourite subscription boxes. I really like the thought they put behind the products they curate for us. The monthly subscription price is $19.99 a month, but if you're a new subscriber to Julep, you can get your very first box free! Who doesn't love that? Just enter the promo code freebox! Click here & start by selecting a style profile! Aleeza I love this post! I wonder if you can do a post that focuses on the lipsticks. I have a really tanned skin and I don't know which set to get. I got the exact same box as you did and I loved it so much!! I love the 20's theme. I think you will love Lady in Red! I can totally see you as a flapper!